The atonement of Jesus Christ is the centerpiece of Christianity. Everything about Christianity either moves toward it or comes from it. It is the atonement which binds the entire body of Scripture together and explains every part. Truly, he who understands the cross understands God, for at the cross we come face to face with God in all His awesome attributes. We also come face to face with ourselves - our sin - and it is there at the place of the revelation of our sin and of God's justice and love that we find the salvation of our souls. But though the atonement of Jesus Christ holds the primary place in all of Christianity, and though all true Christians believe the same basic truths about the atonement, not all Christians are in full agreement regarding the atonement's finer details. In particular, one important disagreement among Christians regards whether the atonement is "limited" or "unlimited". While providing an explanation as to what these terms mean, my aim, in this article, is to address a serious flaw in the doctrine of limited atonement and thereby shed much needed light upon this often bewildering debate. I want to make it clear at the onset, however, that though this issue of limited and unlimited atonement is of supreme importance, I do not press that it is salvational, or a basis for separation. There are precious brothers and sisters on either side of the spectrum, and what one believes in respect to this question does not exclude them from being Christians, nor from the blessed unity that we share in Christ. When we talk about limited atonement things are often confused. Strictly speaking, limited atonement is the belief that Jesus did not die on the cross for the sins of every person in the world but that He died for the sins of the elect only. Sometimes the doctrine is said to mean that Christ's atonement is only effective for the elect, but this is superfluous, for every Biblical Christian already believes this whether they hold to limited or unlimited atonement. Only by believing on Christ is the atonement made effective in a person's life, and since the elect are the only ones who believe, the atonement is effective only for the elect. Unlimited atonement also holds that the atonement is effective only in the elect, but it maintains that Christ died for the sins of all the world. Unlimited atonement is totally distinct from universal salvation, which holds that every person in the world will be saved. No, unlimited atonement holds that although Christ died for the whole world, the atonement is not effective until a person believes in Christ. In this sense, all Christians believe the atonement is limited. Therefore, limited atonement is not to be defined as the belief that the atonement is effective only in the elect (for unlimited atonement also holds this), but rather that Christ actually died for the sins of the elect only and not for the sins of the whole world. As has already been stated, unlimited atonement is the belief that Jesus died for the sins of every person in the whole world, though it is effective only in the elect. But why do people believe in limited atonement? While it may not be admitted by adherents of limited atonement, in actual fact the doctrine of limited atonement is not primarily based upon Scripture. The exegetical case for limited atonement is far weaker than that which can be made for unlimited atonement, and this is quickly discerned by any impartial observer. However, it is not my intent to discuss the exegetical case for and against limited atonement, for that has been done many times over, and there are plenty of resources a person can refer to for a full examination of all the relevant verses in question. Rather, my intent is to highlight the major theological idea which surrounds the doctrine of limited atonement and address the matter at this root. Limited atonement is in reality driven by an important theological rationale which governs the adherent's interpretation of Scripture. What exactly is this rationale? It is the firm belief that only the doctrine of limited atonement upholds the penal substitutionary nature of the atonement without running into the serious problem of double jeopardy. For this I commend the effort, though it is erroneous. I love the man's heart who is jealous for the truth of penal substitution, for this is indeed the glory of the cross and all of our salvation. But the doctrine of limited atonement is not the true nor Biblical way of maintaining this glorious truth of the cross, and it in fact robs the cross of another glory it is trying to preserve: namely, the love of God. Limited atonement adherents rightly see that salvation is found only in the truth that Christ suffered the punishment for our sins on the cross and that this salvation reveals the amazing love of God for sinners. But in saying that Christ died for the elect only it in fact robs the glory of God's love for sinners. No longer is God's love inevitably emanating out from His loving character to the world, but His love is being extended in only an utilitarian sort of way to the elect exclusively because of the plan and not because of His character of love. You see, when you love because you are loving, then there is no longer any significance to quantities, categories or plans. If a compassionate person sees someone injured in a car accident, no matter who the injured person is, he will feel compassion because he himself is compassionate and his compassion is not determined by the injured person but by his own character. The injured person gives him the opportunity for compassion but not the impulse for compassion. But if a person is not compassionate he will not feel compassion unless the person who is injured is someone significant to him, like a family member. In that case he is compassionate, not because of his own character, but because of who the injured one is to him. If God is love, then He loves because of who He is and not because of who or what men are, no matter whether they end up in hell or not. His love is not dependent on the plan, or the outcome, or the significance of someone being elect or not - His love is from Himself as a God of love and therefore it inevitably emanates unto all. As long as we are talking about quantities we are not talking about love. In this way the doctrine of limited atonement destroys the glory of the love of God. For if God did not die for all men then that means that God does not love all men (for "God demonstrates His love for us in this, that while we were yet sinners, Christ died for us", Romans 5:8). And if God does not love all men, then God is really not a God of love but of utility. Oh, banish the thought forever! But what about the issue of double jeopardy? The argument goes as follows: If Christ died for our sins on the cross and paid the penalty that we deserve, then it would be totally unjust for God to punish us again for the sins that Christ already paid for. If the whole world's punishment was borne by Christ, then it would be unjust for God to send anyone in the world to hell for their sins, since that would mean their sins are being punished twice-over. Therefore, if the penal substitutionary nature of the atonement is to be maintained, we must believe that Christ died for the sins of only those who will be saved: the elect. In this way their sins are truly paid for once for all, and the non-elect will be punished in hell for their own sins without it being double jeopardy (a punishment twice inflicted). Makes sense, right? Actually there is a critical flaw that many believers in limited atonement fail to see. Though they think that they are avoiding double jeopardy, the truth is that no one ever avoids having to deal with double jeopardy. For even if we were to accept the view that Christ died for the sins of the elect only, according to this reasoning it would then follow that the elect would be forgiven even before they exercised any faith at all, since Christ already dealt with their sins on the cross! Faith in Christ would be totally unnecessary and nothing more than a pleasant recognition of one's status, not an effector of one's status. Thus, the elect would be justified even before they had faith, simply because Christ died for their sins 2000 years ago and paid the penalty that can never be inflicted upon them again! This unBiblical idea is called "eternal justification" and runs entirely contrary to the doctrine of justification by faith in the Scriptures. Nowhere does the Bible ever teach that a person is justified before they believe in Christ, and it everywhere teaches that it is only through faith in Christ that the atonement is made effective in a person's life. This is indisputable. "He that believeth on the Son hath everlasting life: and he that believeth not the Son shall not see life; but the wrath of God abideth on him." (John 3:36) It is absolutely plain that before a person believes on Christ they are under the wrath and condemnation of God, and this is true for even the elect. "We all were by nature children of wrath, even as others." (Ephesians 2:3) Paul acknowledged his lost condition which he had before he came to be justified through faith. This then makes us ask: If Christ died for the sins of the elect, then why are the elect still lost, guilty and condemned before they believe in Jesus? Aren't their sins gone? Evidently they are not. Thus, even with the doctrine of limited atonement there is the issue of double jeopardy: although Christ died for the elect's sins, they are still under the impending wrath of God until they come to faith. The judgment of God is still threatening to punish them until they believe. Therefore double jeopardy is not an argument in favor of limited atonement, nor is it an argument against unlimited atonement, for it poses no unique challenge to the doctrine of unlimited atonement. Both limited and unlimited atonement adherents have to deal with it. How then are we to explain double jeopardy? Is it true? Is it just? The answer is very simple. Nowhere do the Scriptures say that sins are forgiven by the death of Christ apart from the instrumentality of faith. Justification is by of the death of Christ, but it comes to the sinner only through the instrument of faith. The Scriptures do indeed set forth Christ's death as a penal substitution (Isaiah 53:6, 2 Corinthians 5:21, Galatians 3:13, etc.). Christ actually suffered for our sins. The punishment that we deserve was borne by Him, but still the effect of this sacrifice - the removal of our sins - hangs upon our acceptance of that substitution by faith. God, the creator and sustainer of the universe, the One who is the Good Shepherd, is also the One who will judge the world in righteousness - and He has set the terms. Christ died, but the judge must await our acceptance of His substitution. Justice is perfectly satisfied and God, who is well-pleased with the sacrifice, wants to set us free, but we must be satisfied with the provision that God has supplied for us in Christ Jesus. If we accept the substitution that has already taken place on our behalf, then we go free. But if we refuse the provision of the substitute we must therefore suffer for our sins, and Christ indeed suffered for us in vain. What a horrible thought! See how it is put in Scripture: "Of how much sorer punishment, suppose ye, shall he be thought worthy, who hath trodden under foot the Son of God, and hath counted the blood of the covenant, wherewith he was sanctified, an unholy thing, and hath done despite unto the Spirit of grace?" (Hebrews 10:29) "But there were false prophets also among the people, even as there shall be false teachers among you, who privily shall bring in damnable heresies, even denying the Lord that bought them, and bring upon themselves swift destruction." (2 Peter 2:1) To reject the sacrifice of God's love that He has provided in order that you might escape His own righteous judgment is incomprehensibly tragic. Perhaps the greatest difficulty to understanding this is due to the element of chronological order. Consider, by way of analogy, a boy that is brought to the principal's office for misbehaving. He knows the punishment for what he has done is a whipping. When he gets to the office he discovers that his father is there. His father takes him aside and says to him, "Son, I know that you have been misbehaving and that a whipping is being called for, but I have spoken with the principal and he has agreed that I may take your whipping if you so choose." Of course the boy would cry out, "No, daddy! ", and refuse the offer, but nonetheless would feel the love that his father has for him. But if we can understand this scenario, what is so difficult about understanding the very same scenario if only we re-order it? Consider what would happen if the boy gets to the office and discovers that his father is there, only this time his father takes him aside and says to him, "Son, I know that you have been misbehaving and that a whipping has been called for. But I have spoken with the principal and he agreed that I could take your whipping for you if you so choose. Son," he says with tears in his eyes, "I have already been whipped for you. This doesn't mean that you are automatically free from a whipping, but if you tell the principal that you accept what I have done for you, then he will let you go free." The boy cries out, "Oh, daddy!" and throws his arms around his father. In tears he turns to the principal. "How can I refuse what my father has already done for me? I accept it! I accept it!" Which brings us to a final point in this discussion of the atonement. One of the strongest arguments in favor of unlimited atonement is the free offer of the gospel found all throughout the Scriptures: for the Scriptures are filled with statements that the good news of Jesus Christ is to be preached to every creature under heaven; but there would be no good news to tell every person unless Jesus Christ had actually died for the sins of each and every person. You cannot promise hope to people for whom there is no hope. You cannot tell people God loves them if in fact He does not. But since God commands us to call each and every person to repent and believe the gospel (Mark 16:15, Acts 13:38, 17:30, Romans 10:12-18, Colossians 1:23, 28, 1 Timothy 2:4, Titus 2:11, Hebrews 2:1-4, 4:2, Revelation 22:17, etc.) there must be a real hope corresponding to the call, and there must be a real love for all mankind inevitably emanating from the heart of God. "Look unto me, and be ye saved, all the ends of the earth: for I am God, and there is none else." (Isaiah 45:22) How could God call all the ends of the earth to be saved if in fact it was impossible since Christ died for none but the elect? No, we do not believe in a God who pulls our leg and makes promises that are meaningless and empty. The very fact that salvation is offered freely to all men necessarily requires that Christ died for the sins of all men, just as the Scriptures plainly show us. Let all the world know that God is not a God of utility but a God of love! One of the most unbecoming things I have ever seen is when adherents of limited atonement evangelize the lost, for they do not sound like the Bible. They do not freely offer hope and eternal life through Jesus Christ to the lost. They can never tell the lost that God loves them and that Christ died for them because He may not have. They say: "Christ died for sins" instead of "Christ died for our sins". They say: "If you are elect you are reconciled to God" instead of "we beseech you in Christ's stead: be ye reconciled to God." Thus the sinner is not directed to look unto God's loving all-sufficient sacrifice in Christ Jesus and to God's desire to save them but unto wondering whether they are elect or not. God forbid that this be our evangelism! May our message rather be the blessed good tidings of Christ for every creature! Thus we see that double jeopardy is not an argument in favor of limited atonement, nor an argument against unlimited atonement. Far from precluding unlimited atonement, the penal substitutionary nature of the atonement, which is so clearly revealed to us in the Scriptures, is entirely consistent with the beautiful truth that "God so loved the world, that He gave His only begotten Son" to die for the sins of the whole world. Thus two clear Scriptural truths concerning the atonement are upheld: Christ bore our sins in His body on the tree as our substitute, and He did this for the whole world. The atonement of Jesus Christ is the key of Christianity because it gloriously reveals to us the truth about who God is: a loving God who is perfect in righteousness and a righteous God who is perfect in love. It is in this revelation that we find the salvation of our souls. Thank you for the clarification on the Atonement. Your words are edifying. My questions remains, though it is off topic a bit. Why did a God of love require that His only begotten Son suffer such incomprehensible pain in the Garden and then die such a violent and humiliating death? Why all the symbolism related to Jesus' life (born in a manger, baptized at the lowest elevation of moving water on Earth, Gethsemane meaning "olive press", etc. The symbolism goes on and on as if God is trying to teach us something aobut the Atonenment). What is the purpose of Jesus having to pass through such humbling circumstances His whole life and then finalize His work by taking on our sins and then ultimately being abandoned by the Holy Spirit on the cross though He had never sinned? Why couldn't God simply forgive those who believed in Him without having the messy business of the atonement? In the overall scheme of things why must there even be an Atonement? Why doesn't God simply extend full restitution of Grace to those who believe in Him? That is one of the most important questions a man can ask. The answer from Scripture is clear and non-debatable. The reason why Jesus had to die was because God is just, and He cannot forgive sin except it be atoned for. Every sin must receive it's just desert, and God would be untrue to His own character to let sin go unpunished, especially since He has declared that He would punish it. Therefore, in order for God to be just and yet justify the ungodly (a thing unthinkable without the cross), Jesus died to be the propitation for our sins. The atonement does not speak of God's unwillingness to forgive, but of His willingness to forgive sinners. Because God loves sinners, He has provided the only way for them to be forgiven while at the same time being true to His righteous standards. Let us worship God for the sacrifice of His Son which tells us of God's righteousness and love! Let me abbreviate my question. Surely, God is just. Why does His justice require the violent and humiliating death of His perfect and only begotten son? Does Jesus' suffering generate Grace? If so, who or what has required the generation of grace in such a manner? God is love, therefore sufficient Grace should simply exist, I would think? That's an excellent question, Pilgrim. I'm sure the answer is very profound. Of course, much of what Jesus suffered was at the hands of man, but when He prayed in the garden of Gethsemane He was not thinking about the pain and shame He would experience from men's hands, but the dreadful wrath that He would experience at God's hand. Jesus died for our sins, and the wages of sin is death. Jesus drank the cup of death in all it's dreadfulness. Everything that death means Jesus experienced. Condemnation, God's displeasure, being forsaken, shame, contempt, pain, rejection, suffering, agony, the physical cessation of life... all these are a part of death. When we look at how Jesus suffered we learn how horrible a thing sin is and just what is required in atoning for it. Sin is an abomination to God, and when Jesus became sin for us He became the object of God's wrath. Let us learn how God feels about sin. An eternity in the lake of fire awaits all those who refuse to accept the substitute that has been provided for them. Thank you Lord for loving us and giving Jesus for us even though we deserve Your wrath! This article will show why the Biblical term for "Atonement" is incompatible with Penal Substitution. I disagree, and you have shown by your article that you don't understand the nature of the Levitical system nor atonement in the Old Testament. To even imagine that sin can be atoned for by a bag of flour is to not merely misunderstand the Scriptures, but to make the death of Christ meaningless. If we could be forgiven by such an atonement as you have argued for, Christ would never have needed to come. Do you think a teacher who teaches that it is necessary to obey a law to be saved is a false teacher? You used the expression "a law", so because I'm not exactly sure what your question means, I will answer by saying that if by "law" you mean any moral or ceremonial commandment such as "you shall not commit adultery" or "you shall not trim the corners of your beards", then yes, I absolutely believe such a teacher is a false teacher. For salvation is clearly said to be through faith in Jesus Christ apart from any law or commandments whatsoever (Rom. 3:21, Gal. 2:16, etc.) If salvation required any obedience to commandments it would require total obedience to all of God's commandments. And if so, then Christ died for nothing. I liked your post very much. Its good to see an emergent thoughtful criticism of limited expiation/imputation of sin. A lot of times folk on both sides through out claims without understanding the mechanics of their own view of imputation and expiation. What strikes me in a lot of limited expiation polemics is that there is so much stress on what Christ "accomplished" on the cross, such that the role and activity of man is thinned out. Faith is not seen as an instrumental cause and condition, but more a passive reception of what has already been accomplished on the cross. Behind this is the over-emphasis of pecuniary categories: see the satisfaction as a concrete payment. No, we do not believe in a God who pulls our leg and makes promises that are meaningless and empty. Eli, if Jesus has died for all but not all will believe because not all will be called by God's irresistible call, then it still seems like the promise is meaningless and empty for those who are not elect. Even if the potential to be saved is there, there is no hope for them because they will never believe. However, there is no one alive who can say that the promise is meaningless and empty for them, since, in order to say that, they would have to know that they are not elect (which no unbeliever can truly know until they die, right?). I forgot to subscribe to any follow up comments. I'm doing that with this post. But the promise of salvation is not sent only to the elect but to every creature. The gospel is not trying to "find the elect" so to speak, but it is good news to the world. If Christ did not die for every creature then such a promise is empty and meaningless. There is nothing unusual about the fact that God calls those whom He knows will reject Him. He does it because He loves them, and manifests His love for them by calling them aside from danger. If they perish it will not be because they didn't have a salvation offered to them, but because they rejected it. Praise our Lord Jesus Christ! Eli, Thank you for this! I can clearly see that the Holy Spirit inspired this article! I have been struggling terribly with with the false doctrine of Limited Atonement! This article has blessed me so much! I will share it with others! I so appreciate your heart and your contending for the faith! May the Lord make his face to shine upon you my friend! Your ideas on limited/unlimited atonement are not new. They have been debated for centuries by men of God on both sides of the theological divide...John Wesley and George Whitefield come to mind. What seems to be taken for granted in your argument is the moral ablity of man to come to Christ on his/her own, apart from the regenerating work of the Holy Spirit. I reject this implicit premise. Ephesians tells us that we were dead in our sins. How can a dead man choose to "accept" Jesus? John 6:44 tells us that noone can come to Jesus on their own. This speaks to sinner's inability. Total depravity( radical corruption) is the doctrine that gets its legitimacy from verses like these, and is really what must be understood in order to fully comprehend particular redemption. Usually what happens here is that Weslyans/Arminians espouse the doctrine of "prevenient grace". Two things...where is that found in the Bible and what ultimately is the deciding factor in my accepting this prevenient grace? Just a few thoughts for you to consider..
Hi daveyboy, thanks for the comments. What might surprise you is that I myself am a Calvinist and hold to depravity, unconditional election, irresistable grace and perseverance of the saints. It is limited atonement that I reject, and one does not have to be a 5-point Calvinist in order to believe in the doctrines stated above. Did you know that John Calvin himself did not believe in limited atonement? Check it out for yourself. Nor did Martin Luther, John Bunyan, John Newton, nor J.C. Ryle, to name a few well known Calvinists who did not hold to limited atonement. There are many, many more. We mustn't generalize people; too much of that goes on. and also www.calvinandcalvinism.com for starters. Grace and peace to you too. "First, I love his attitude toward us Limited folks: it is gracious, and I agree with him all the way through his definitions, which is very rare. So, kudos so far. But, thus far and no further shall my kudos go, here my proud praises shall stop. His assumption on the reason for believing in Limited Atonement is wholly erroneous. There may be people that believe LA solely to defend the penal substitutionary atonement, but I know of none. I hold to the doctrine of LA because the Bible repeatedly and clearly states that Christ died to SAVE the world. The question should be "What did Christ's death accomplish?" The answer is that His death saved the world. Nowhere is potentiality discussed. Among His last words are "It is finished," precisely because it was: that is the date that we were saved. The rest of his argument regarding the love of God, is based on the misconception that love and hate are opposites, when in fact they are co-requisites; indifference is the opposite of both. "Jacob have I loved, Esau have I hated." His whole issue of double jeopardy was quite interesting, but largely semantic. Faith itself is a gift from God, so why is it an issue? Without God giving us faith in His Son, of course His Son's death is not efficacious for us. Both Christ's death and the faith that appropriates that to us are gifts from God, and probably applied to us at the same time. Christ is the "Lamb slain since the foundations of the world," why is this not a problem? If us being saved two thousand years ago is such an issue, how do we deal with the Bible's issue of us being saved six thousand years ago? But the final and most simply damning argument is the formerly mentioned: "What did the death of Christ accomplish?" For the answer to this, we turn to Scripture, and we find that Christ saved the world. It did not offer salvation, it accomplished it." Hey Steve, great to hear from you. If you check any book on Limited Atonement or any 5-point Calvinist systematic theology, you will see that the real arguments which are made in favor of Limited Atonement are philosophical in nature rather than Scriptural. Of course Scripture will be used, but the main point is exactly what your friend is saying: it is argued that Christ's death "actually accomplished salvation", and this is directly due to the idea of penal substitution. Charles Spurgeon (who I love but disagree with on this subject) was famous for arguing this way. The problem with your friends view is that nowhere in the Scriptures is it ever taught that Christ's death on the cross actually accomplishes salvation apart from faith. While it is only the death of Christ that is the reason for salvation, our salvation is only accomplished when we believe. Christ said, "It is finished", which meant that the propitiation had been accomplished which enables God to justify the ungodly (Rom. 3:26), and it only remains now to call men and women to be reconciled to God (see 2 Cor. 5:14-21). A person is not saved the day Christ died. We are saved, by virtue of the death of Christ, the day we put our faith in Christ. The consistent conclusion of your friends reasoning is the doctrine of eternal justification, which is so clearly not Biblical that the majority of 5-point Calvinists reject it. I would encourage you to pass along to your friend my follow up article to this one: http://www.timothyministry.com/2011/03/letter-to-limited-atonement-brother.html. It answers the typical questions that are raised. Two outstanding books on this subject are, 1) The Death of Christ by Norman Douty, and 2) The Death of Christ by James Denney. I am sorry I've not been able to follow this thread, but I understand the sentiment on both sides. Limited Atonement is established on 'Systematic Theology' grounds, not Scriptural, but that 'Systematic Theology' is pretty logical: If Jesus took the punishment man deserved, then that man cannot be damned (via double jeopardy). If Jesus died for all men, then nobody would go to hell, which is heresy. Thus, Jesus only died for some, via reductio-ad-absurdum. The only "out" is to reject Penal Substitution. Considering John Calvin rejected Double Imputation, means there are no legs left supporting Sola Fide. You may have missed what I wrote in this article about double jeopardy. Please give it a read again, because your reasoning is not taking into account all that is to be considered. For a complete explanation of justification by faith without works, read Romans 1-5. On this doctrine the Protestant Reformers hit the nail right on the head. Your objection to the Double Jeopardy dilemma is that, as they present it, they should also be teaching Eternal Justification (saved prior to faith), but such is plainly unscriptural. This is a solid objection. But you ultimately concede that even your position has the Double Jeopardy dilemma, which at that point is not making the better argument but only exchanging one difficulty for another. The analogy you gave of a dad being spanked in place of his boy is somewhat fitting, but it actually captures the seriousness and problem of the DJ dilemma. There was a punishment X due to sin X, and that punishment X was inflicted on the dad apart from the boy's choice. It makes no sense to say punishment X can still be hanging over the boy. Thus, eternal forgiveness is the result. To say the dad got spanked for his two boys, one of whom wouldn't accept it, means the dad got punished needlessly, which is an abomination, compounded by the fact the punishment is *also* going to fall upon the faithless boy. So the real culprit here here Penal Substitution, which forces one to either take the Eternal Justification road or to take the Punishment Twice Inflicted approach. The alternative is if the Dad made some sort of good works as satisfaction (NOT received a punishment), such that the principal would see that and drop the charges of spanking all together for those who apologize. Thus Double Jeopardy isn't even even an issue. This is precisely what it means to be an Intercessor - to 'go between', not take the place of one of the two parties in dispute. You reject LA because no good case can be made from Scripture. Good. But can you make a good case from Scripture that all of a believer's sins - past, present, future - are forgiven at the moment of Justification? If you look carefully, the Bible says no such thing; only "past sins" are forgiven (e.g. Mk 11:25; 2 Pt 1:9), though Psub (logically, not exegetically) demands even future ones be forgiven that moment as well. "I haven't had a chance to check out his other article, and I don't currently have time to respond to his entire (very gracious and quite intelligent) response to my poorly articulated post, but here's one thing. I agree that Christ's death, apart from faith, does not save us. But the desire to be saved, along with the faith, are both gifts from God, as is the death of Christ. These are all from God. So if He knows the future, as He does, and if He has always known the future, as He has, then why is this a difficulty? Before He laid the foundations of the world, He knew whom He would save, and He planned every single thing that was necessary to save them. We love Him, for He first loved us. I'll respond to more in time, but I'm afraid I'm debating with someone who may well be out of my league. It is an honor and a delight to encounter someone that is willing to debate in a gracious and Christian manner, and I look forward to more interaction. I don't know exactly where you and Jesse disagree at this point, but somehow I think you're both right. My gut tells me that this whole thing might be less confusing if Christians didn't see the atonement as a zero-sum game; I think that might be the weakness of Calvinism. The Spanish explorers (whose culture preceded the Reformation), I read recently, in their ignorance of the concepts of scarcity and inflation, basically believed that gold had some sort of magical aspect to it which made it always valuable and effective. I think we'd be better off if we viewed the cross in that way! 2 Corinthians 5:20-21 is a letter to the church and is intended to comfort needy sinners drawn by the Spirit. It is not a call to the self righteous. Gospel calls to rest in Christ are always particular for needy sinners and never universal for the self-righteous. The self righteous should be sent to the Law. If we would understand this one truth; that faith in Christ is not duty in the law, souls are not cursed by the law for not resting in Christ, nor is faith in Christ a blessing directed for the self righteous... then we should understand that a particular atonement is not inconsistent with the call of the gospel. The question of double payment is not the proper focus in the controversy. The question of double bearing is the real question. The focus should be on Christ bearing our sins "in his own body on the tree", purging "our sins" when He sat down on the right hand of the majesty on high, the iniquity of us having been "laid on Him" when he was "made sin" and "made a curse" for us. If all the sins of any sinner were laid on Christ, borne in the body of Christ, cursed on Christ, purged when He sat down on the right hand of the majesty on high, and put away by the sacrifice of Himself before the sinner was born... to curse the sinner in eternal hell is to state that Christ bearing our sins and being cursed for them has not redeemed us from the curse... but our faithfulness to believe He offers an opportunity of redemption is what finally and actually redeems us from the curse. If we would understand that faith is the means of embracing the peace of our sure redemption in Christ and living in the fellowship of this hope, then we should not confuse faith as a condition to finally redeem us from the curse of the law. These are some notes on 1 John 2:2. It is my desire to preach this scripture to comfort needy and not to send souls wondering whether or not they are elect. The purpose of the epistle is to comfort and direct God's children that they sin not. If any among God's children in the whole world sin, we have Christ as our everlasting advocate with the Father. Come all who are burdened with the guilt of sin and look to Jesus Christ who is the propitiation for your sins. The hope and comfort of the atonement is for any man among God's little children that has sinned. The effect and hope of the atonement is for God's children among all nations in the whole world. This effectual hope is not intended to comfort the self righteous, nor is it intended to redeem those who perish in eternal hell. For Christ's propitiation does not extend any further than His advocacy and His advocacy is not an opportunity that may leave us in eternal hell, but rather a sure promise of eternal grace. Jesus laid down His life for the sheep and prayed for His own in the world. He is not the propitiation for a limited manner of sins committed in one nation but also for all manner of sins committed in the whole world. See Matthew 12:31. He is the propitiation for all manner of sins committed in the whole world. Let every poor and thirsty soul embrace Christ as their eternal redemption. This letter was not only intended for a specific church, but it was intended for the children of God throughout the whole world. The context is intended to comfort the "any man... [or "a certain one" -Thayer's Greek]. In the context, the certain one's among the whole world who are confessing their sins upon hearing the gospel in this epistle. For Christ is "faithful and just to forgive" their sins and "to cleanse" them "from all unrighteousness." Christ's mediation is suitable and sufficient for the sins of the certain ones in the whole world who come to God by Him. He is their advocate. When Christ is your advocate, be sure that His advocacy shall keep you in Him forever. For He says, "If any man sin, we have an advocate..." The context presents the advocacy of Christ as the ground of our hope. Notice in verse 2:1 he says, "If any man...". He is seeking to comfort the "certain ones" in the "whole world" who are one of God's "little children" who are confessing their sin. I very much appreciated your article as an honest attempt to logically address a very difficult issue. However, I think it's important to recognize that there are many supporting arguments for both sides. Romans 9:13 "As it is written, Jacob have I loved, but Esau have I hated." Note that the verses don't say that God hates the sin but loves the sinner; they clearly speak to God hating the sinner, as difficult as that is to read or understand. I also recognize that there are verses such as John 3:16 which seem to argue the other way, but there are also counters for those verses. For example, in Acts 19:27, are we really supposed to believe that everyone single person in the entire world worshiped Artemis? Similar arguments could be made from John 12:19 and John 3:26, to list a few. My point is simply that while we do need to scour the Scriptures in order to fully form our theology, we also need to be careful not to pronounce certain grey issues as black and white. While I certainly lean towards the 5-point Calvinist, I also acknowledge that there are certain verses which I simply can't reconcile. As 1 Corinthians 13:12 wonderfully promises: Now I know in part; then I shall know fully. I have no problem with verses that speak of God's hatred for sinners, because I believe that God can both love and hate a person at the same time. In His just wrath He abhors and opposes the sinner, while in His loving mercy He loves that same sinner. God loves the objects of His wrath. Such is the amazing teaching in the Bible about our God. Picture a police officer walking down the road. All of a sudden, he sees his beloved son rob a convenience store and come running out of the store, down the sidewalk, running right toward him. His son doesn't see him. The police officer is filled with conflict: on the one hand, he loves his son so much and knows that if he tackles him, his son will have to pay greatly. This he does not want. But at the very same time, he swore an oath to do his job, and to be a good police officer he must tackle his beloved son. The situation is so much more intense with God, because God is not doing a job like a police officer. His very nature is just, and He abhors and hates sin, and thus sinners. But His nature is also love, and He loves those same sinners whom He opposes. The solution? The cross of Jesus Christ. Thanks for the thoughtful response, Eli. However, I'm left a little confused. You claim to be a 4-pointer, believing in predestination and the elect, but then apparently believe that God actually 'wants' everyone to be saved. If that was the case, He would predestine everyone, since no one can be saved apart from His irresistible grace and effectual calling. However, as Romans 9 clearly states, God creates some vessels to receive mercy... and some to receive wrath. He only gives mercy to some, and it has nothing to do with man's will or desire. What shall we say then? Is there injustice on God's part? By no means! For he says to Moses, “I will have mercy on whom I have mercy, and I will have compassion on whom I have compassion.” So then it depends not on human will or exertion, but on God, who has mercy. For the Scripture says to Pharaoh, “For this very purpose I have raised you up, that I might show my power in you, and that my name might be proclaimed in all the earth.” So then he has mercy on whomever he wills, and he hardens whomever he wills. 1) The Arminians try to argue against predestination. Get rid of personal predestination altogether and so solve the problem. This, I believe, as do all Calvinists, is not exegetically sound. 2) The 5-point Calvinists try to do away with God's desire for all men to be saved. Do away with His universal love toward all men, and make it about tribes and tongues and the world in general, and problem solved. This also I do not believe is exegetically sound, nor consistent with the heart of God revealed in Jesus Christ (which the Arminians see and hold on to). So what's the answer to the problem? If God loves and desires all men to be saved, why doesn't He predestine all men? The question is: why? The 5-point Calvinist answers: He doesn't predestine all because He doesn't love and desire all! The Arminian answers: He DOES love and desire all; it is that He doesn't predestine at all! Is there any other way to look at this? Of course there is. 3) Both of these camps fail to consider that the reason God does not predestine all men to be saved may have nothing to do with His desire for all men to be saved, but may have to do with a totally separate reason altogether. In fact, that is the case. If God does not elect someone for salvation, it is not because He doesn't love them (as both 5-point Calvinists and Arminians imagine), but for another reason entirely. That reason is given to us explicitly in Romans 9. So here, in that most critical of election verses, we are presented with ANOTHER desire of God that has not been sufficiently considered. God desires to show His wrath. He desires to make His justice known upon sinners. I submit that this desire is the sole reason why God does not elect all men unto salvation, even though He loves all men and has a true desire for all men to be saved. He is the judge, in the often told analogy, sending His beloved to prison. Thus we learn, exegetically, what the key to the philosophical problem is: there is a conflict of desires in God. God desires all men to be saved, but He ALSO desires to show His wrath. If He predestines all men, then He cannot show His wrath. Thus God, the God of love who died on the cross for all mankind, painfully and with longsuffering allows sinners to plunge on in their rebellion against Him to their righteous destruction. I must emphasize how incredibly difficult this must be for God. He does not elect them, but this is no reflection upon His love for them. Can't we see the tears of God for the wicked who perish? "Have I any pleasure at all that the wicked should die?" (Ezekiel 18:23) This is a reflection upon the conflict of desires in God, a highly complicated and difficult situation where God shows us both His justice and mercy, both His goodness and severity, and how truly amazing He really is in every way. Does this leave open the great mystery as to why one is elected and not another? Of course it does, but so must any Biblical view of election. We must be content to leave that question to God. The main point of all this is that the revelation of the abundant goodness of God toward mankind at the cross is not diminished or obscured in any way by the doctrine of election, because the reason for God suffering some men to be lost is due to a separate desire of God to demonstrate justice and has nothing to do with His lack of love for them. Illustrations of this truth can be multiplied again and again in both the Bible and the natural world. Our doctrine of election must never corrupt or obscure the revelation of the goodness of God revealed in the cross of our Lord Jesus Christ. That revelation must control all of our thinking about everything God. Sadly, I do not believe it has, and though I disagree with the Arminians on exegetical ground, I commend them more than the 5-point Calvinists for their desire to see this be so. Lots to meditate on, brothers. Thanks for the excellent discussion. Thanks for the extremely insightful and thought-provoking response, Eli. While I'm not sure if I agree or disagree with your response on the whole, I do think it offers a strong possible answer to what is obviously a very difficult dilemma, and one that I've never heard communicated as well as you did it. So I sincerely thank you for that. This, of course, brings us full circle to my original post about how we simply don't know and understand everything yet, but thankfully one day we will. One last thought I have is this: while I see where your answer was going with your analogy of the policeman and his son, I'm not sure if it truly does the love/hate issue justice. While your usage of the word 'opposed' made the analogy work, the basic dictionary definition of 'hate' is quite a bit harsher than that: intense animosity or dislike; to detest; extreme dislike, etc, etc. I'm not quite sold on the fact that you can love and hate someone at the same time; it seems rather either/or to me. In your example, I don't really think the policeman 'hated' his son in this sense of the word. Rather, he was very disappointed and saddened by his actions. That seems different than the verses regarding hate that I posted earlier. For instance, it doesn't say that God is frustrated by and opposes those that do iniquity. It says He hates them. Of course I am not God and I am not claiming to be the definitive expert on this, but from my limited perspective, trying to argue that you can hate and love someone at the same time seems to cause some logical discord. I agree that the word "oppose" is not as strong as the word "hate". That is certainly where the analogy breaks down, but as I said, it is indeed different for God because He is not doing His job, He is being Himself, and His own nature abhors sin and hates sinners because of His essential righteousness. I do believe God can both hate and love a person at the same time. Does not God hate all workers of iniquity? And were we not all workers of iniquity at one time? 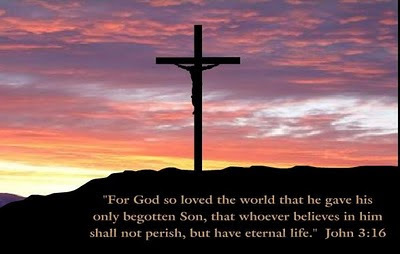 God must have loved those whom He hated, for He sent His Son to die for our sins. As the famous song sings: "He loved me ere I knew Him, and all my love is due Him." So I don't see how we can escape this conclusion. That's a great point, Eli. Blessings to you, as well! You have an amazing blog. I've really enjoyed a number of your posts and your view of His Grace. I'm not sure where I stand on limited or unlimited attonement, I think for sure there is a universal offer of the Gospel to all mankind, but whether people become sheep by believing or believe because they are sheep is debatable. The offer should still be made. Your example with the principle was really very good. I was hoping you would explain how God can still be just if He whipped the boys dad, and then the boy didn't accept that, so the boy was whipped as well? If the principle whipped the boys dad, and the boy doesn't accept this, the boy is then sent to hell and punished. Is the principle just in this situation? Hi Justafriend, thank you for your comment. I believe all that would mean is that the father got a whipping in vain. It would end up being an unfortunate situation, for the whipping did not spare the son. No injustice is done, but the father ended up getting whipped for nothing. Except that it actually didn't do nothing: the love of father was clearly displayed toward the son, and the son's wickedness is displayed in an even greater way against the father. This, I believe, is one of the things the cross displays when people reject Christ. It reveals God's goodness towards sinners and man's hatred against God. So even if a person is not saved, Christ did not really die in vain. If I can help explain why I'll give it a go. The reason why is because God is a just God and therefore the laws that he set for creation must be fulfilled. A debt must be paid. It's shown all through the sacrifices of the goat and the goat that takes the sins of the people and escapes. Only to satisfy the sun's of the whole world it would take more than a human sacrifice even though humans are the ones who sinned. Now enters Christ who is all human and all God. Jesus being human suffered the penalty. But being God he could also remain sinless. To crucify a sinless man (Christ) so mercilessly for the sins of the world satisfied God's just law. No man could take the penalty because no man could ever be sinless. God himself has to take on the task and bear the shame but he also received the glory when he rose and conquered the original curse of sin (death, remember Adam and eve) forever. Yes God could simply have just said nah I'm gonna do it this way. But then how could we trust his ruling. If he switched it up on a whim then he isn't just. You can't take God at his word. How everything played out showed God's love at far he's willing to go, his just ruling to remain holy and true, his mercy for our sinful behavior and his wisdom to bring it all fourth. Remember his thoughts are not our thoughts and Gods ways are not our ways. Christ said if at all possible father, let this cup pass from me. Basically he was saying "father if there is any other way then please do that" so if your way would satisfy God's just judgement for the sins of the world then that's what would of happened but instead That cup of suffering and death did not pass from Jesus. Hope that helps. Sorry if I mistyped anything I wrote this on my phone.